West Liberty-Salem’s Holden Nease (23) barrels through a pair of Jets defenders in transition on Friday. 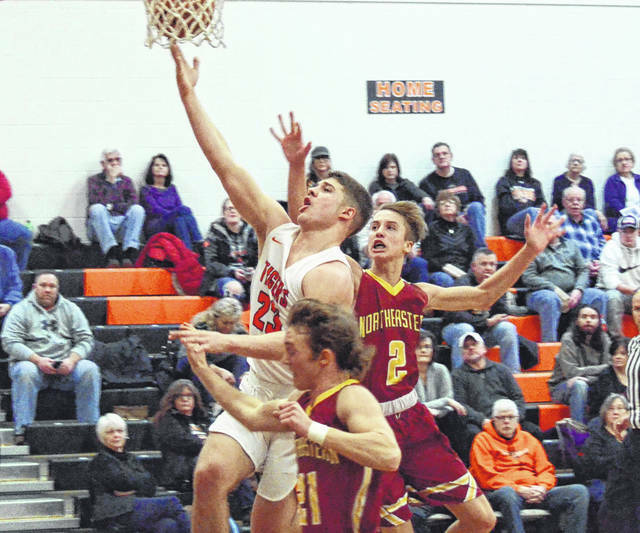 WEST LIBERTY – WL-S used a tenacious effort and wore down Northeastern to beat the Jets, 59-35, in OHC boys basketball on Friday. “The first quarter, we had several guys up delivering pressure, but not everybody was. And that kinda put everybody back on our heels a little bit. But once we got our wind and the energy picked up, we were a headache there for a while,” WL-S Coach Darrin Leichty said. WL-S trailed, 12-9, after a quarter, but started the second on a 7-0 run and pulled away for a 30-20 lead at intermission. The Tigers (11-6, 9-4) crashed the glass and jumped passing lanes with a certain ruthlessness, savagely stifling any hope the Jets had as the game wore on. Holden Nease scored 22 points for the Tigers, with Eli McGill and Jack Eggleston adding 10 each. “It took us a while to kind of get everyone’s roles figured out, but I feel like we’re getting there. We’ve got room to grow yet, which I think is a good thing. I don’t think we’ve peaked yet,” Leichty said. In the jayvee game, WL-S won, 46-35. Tanner LeVan had 12 points and Gavin Harrison added 9 for the Tigers. In the freshman game, WL-S won, 50-16. Logan Saylor had 19 points and Isaac Brown scored 13 for the Tigers. https://www.urbanacitizen.com/wp-content/uploads/sites/36/2019/02/web1_HoldenNease020119_ne201921202914437.jpgWest Liberty-Salem’s Holden Nease (23) barrels through a pair of Jets defenders in transition on Friday.